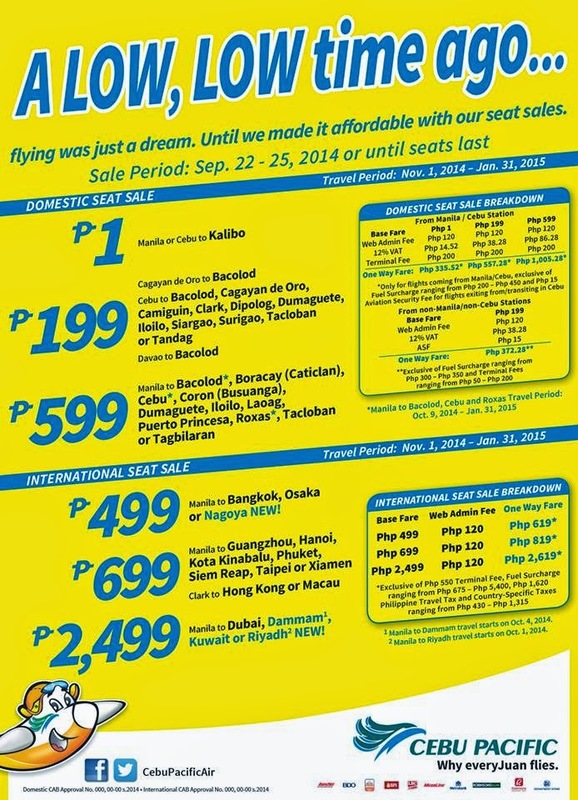 Cebu Pacific Promo Fares 2019 to 2020: Piso Fare 2015 to Boracay is still on! Piso Fare 2015 to Boracay is still on! Piso Fare Promo: A LOW, LOW time ago... flying was just a dream. Until we made it affordable with our #CEBSeatsales! Cebu to Bacolod, Cagayan de Oro, Camiguin, Clark, Dipolog, Dumaguete, Iloilo, Siargao, Surigao, Tacloban or Tandag NEW! Manila to Bangkok, Osaka or Nagoya NEW! Manila to Dubai, Dammam 1 or Kuwait or Riyadh2 NEW! 1. Dammam travel starts on Oct. 4, 2014. 2. Riyadh travel starts on Oct. 1, 2014. Manila to Sydney, Australia* NEW ! Manila to Sydney fare is one way inclusive of Web Admin Fee, Australia Airport passenger charges and 7 kg baggage allowance, but exclusive of Php 550 Terminal Fee, Php 1,620 Philippine Travel Tax to be paid at the airport upon departure from Manila and checked-in luggage. Quoted DOMESTIC one way fares are inclusive of Base Fare, Php 120 Web Admin Fee, 12% VAT, Php 200 Terminal Fee for flights transiting in or exiting from Manila/Cebu Station and 7 kg hand-carry baggage allowance, but exclusive of Fuel Surcharge ranging from Php 300 - Php 550, Php 15 Aviation Security Fee for flights coming from Cebu and check–in baggage. Terminal Fees ranging from Php 50 – Php 200 for flights originating from non-Manila/non-Cebu Stations must be paid at the airport. Quoted INTERNATIONAL one way fares are inclusive of Base Fare, Php 120 Web Admin Fee, and 7 kg hand-carry baggage allowance but exclusive of International Terminal ​Fees ranging from Php 550, Php 1,620 Philippine Travel Tax, Fuel Surcharge ranging from Php 1,125 – Php 5400, Country Specific Taxes ranging from Php 585 – Php 1,315 and check-in baggage. Promo fares have limited availability and are non-refundable but rebookable subject to the following rebooking fees: Php 1,200 for Domestic destinations and Php 2,000 for Short-haul International destinations plus fare difference. Please note that booking fee rates range from Php 120 –Php 200 depending on purchase channel. For your convenience, flight changes, availing of prepaid baggage allowance for check-in baggage and web check-in service can be done up to 4-hours before scheduled flight. Book your flights at http://bit.ly/CebuPacificAir now! Hi, Thanks for inquiring. Promo fare for your preferred trips are currently unavailable. Pls. refer to the above post po. you may please do a mock booking po thru cebupacificair.com or visit any nearby ticketing office or agency or call these nos. for inquiry: Call (02) 70-20-888 in Manila, (032) 230-88-88 in Cebu or visit this FB page every once in a while regarding promo updates for your preferred trips. Thank you. gnon prin b ang byad pblik.. from kalibo to manila..
Hi, Thanks for inquiring. Pls. refer to the above post po. There is but we cannot give you exact amount, as fare rates will depend on the date and time of your flight or you may please do a mock booking po thru cebupacificair.com or visit any nearby ticketing office or agency or call these nos. for inquiry: Call (02) 70-20-888 in Manila, (032) 230-88-88 in Cebu or visit this FB page every once in a while regarding promo updates for your preferred trips. Thank you. meron po ba promo from davao to palawan..? ?february po sana ang flight..
Hi, Thanks for inquiring. you may please do a mock booking po thru cebupacificair.com or visit any nearby ticketing office or agency or call these nos. for inquiry: Call (02) 70-20-888 in Manila, (032) 230-88-88 in Cebu or visit this FB page every once in a while regarding promo updates for your preferred trips. Thank you. Good Evening! Ask ko lang po kung valid I.D lang ang kailanganin? At paano mag booking ng ticket. ?Thank you! sa oct 30 po aq aalis papuntang tacloban magkano po ang 2way fare? Cebu Pacific Air is WiFi Ready! Piso Fare 2015 to Kalibo now!